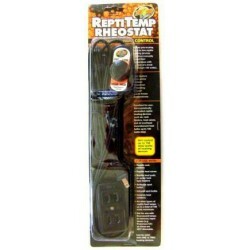 Buy Wholesale Reptile Thermostats, Timers & Controllers For Sale at Bulk Prices! 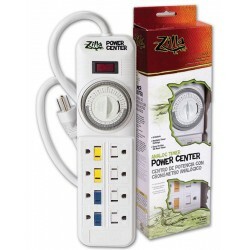 Complete habitat control in one power strip With minute-by-minute accuracy, this Digital Power Center centralizes the control of lights, filters and heaters for a healthier reptile habitat. 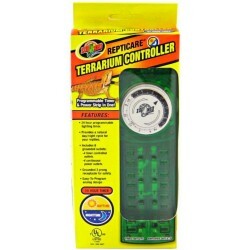 Replace the tangle of wires and timers behind a reptile terrarium with a single safe power strip featuring built in control. Spin the handy dial to set on/off times for four plug-in devices while simultaneously powering four devices that run constantly. 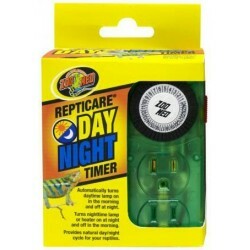 The ReptiCare Day & Night Timer turns Daylights on in the morning and off at night, and Nightlights on at night and off in the morning! 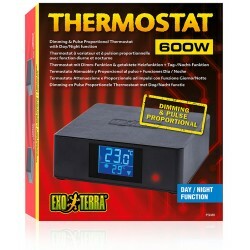 This dimming proportional thermostat is a "table top" model designed to sit nicely on top of your racks or cages. No more trying to figure out how to mount your thermostat so you can see it, or dealing with stands. The VE-300X2 adds the additional convenience of two independent thermostats into one unit! This is really helpful on rack systems or cage stacks with cooler temps on the lower shelves or cages. 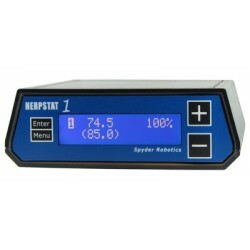 The Herpstat 1 is an advanced controller that can be used for precision temperature control, lighting control, and even humidity control. 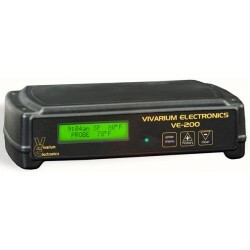 Housed in desktop style cases they can easily sit on top of your rack, cage, or incubator. Dual proportional temperature controlling modes (Dimming or Pulse) are built in so you can choose the mode that works best with your setup. 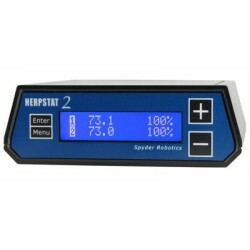 The Herpstat 2 is an advanced controller that can be used for precision temperature control, lighting control, and even humidity control. Housed in desktop style cases they can easily sit on top of your rack, cage, or incubator. Dual proportional temperature controlling modes (Dimming or Pulse) are built in so you can choose the mode that works best with your setup. 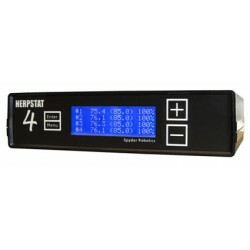 The Herpstat 4 (v2) features four probe & outlet jacks which are individually configurable and comes with four temperature probes and power cord. Version 2 added features include a new fan-less control board for silent operation, Basking Assist mode that now provides compatibility with heating lamps as a heat source, both Dimming and Pulse proportional heating modes and a replaceable power cord. This thermostat is a "wall mounted" model designed to mount nicely to your wall or rack with built in mounting tabs. Great choice for a number of hobby needs including Reptiles, Home Brewing, Seedling Germination and more! 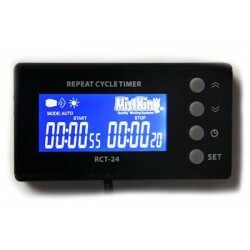 MistKing Repeat Cycle Timer is an ideal choice for aeroponic and other growers that use the MistKing misting systems. 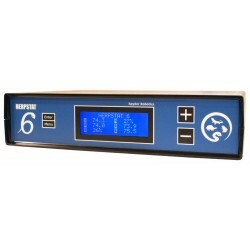 You can now control misting with separate repeating ON and OFF intervals for day and night. NOTE: This Controller will only work with MistKing Misting Systems. 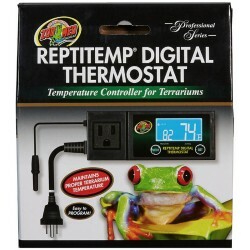 The Zoo Med Digital Thermostat controls temperature by turning on heating devices in “HEAT” mode or by turning on cooling devices (e.g. fan) in “COOL” mode. 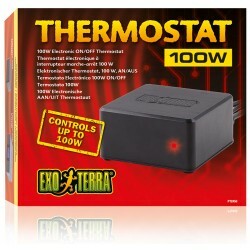 With a turn of the knob, you can adjust the temperature of most heating devices! 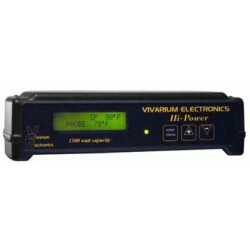 Plug in up to two compatible heat sources with a combined wattage of up to 150 watts! Turn your heaters down or back up depending on the ambient room temperature. 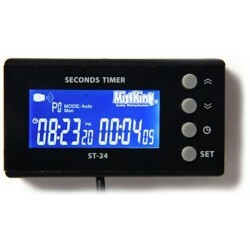 The new version of an exclusive MistKing Seconds timer is now available. This timer has very cool improvements over our old seconds timer. It works only with MistKing Misting Systems. 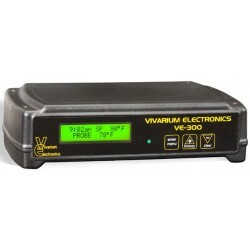 It can be connected to a 110V or 220V system with no problems. NOTE: This Controller will only work with MistKing Misting Systems.